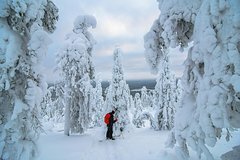 If you have an extended layover at the Kuusamo Airport or staying in town, why not consider getting out with some fun activities? We list a few here and there are many more on Kuusamo.LayoverIdeas.com. Ruka is one of the biggest ski centres in Finland. Ruka is situated in the municipality of Kuusamo and is its main tourist attraction. In Ruka village, there is no need for cars. In the Ruka Pedestrian Village you can walk to the slopes from the hotels without any crossings. Kuusamo Airport is located about 27 kilometres from Ruka (Rukatunturi, in Finnish). Kuusamo Airport is connected (by bus) to the most popular hiking trail in Finland: Karhunkierros (also known as the trail of the bear). The 80 kilometre long trail leads through two beautiful national parks, though there are also several shorter variations of the trail. The trail is easily accessible from the Kuusamo Airport with a bus that takes you to the beginning of the trail. Although the difficulty level is quite easy, you should still be prepared with a decent map and enough food. Water is not a problem, as there are plenty of rivers that have clean and drinkable water. There are several open wilderness huts (autiotupa), where you can stay for free. The huts tend to get full during peak season (end of June to beginning of August), so you should consider bringing your own tent. Famous metal spoonbait manufacturer Kuusamon Uistin is located on Kuusamo, factory shop is located in the plant. Cafe. An arctic safari is suitable for families and small groups. Options include snowmobile-, husky-, ice-fishing-, reideer sleigh-, snowshoe trekking and cross-country skiing safaris, canoeing, cycling, white water rafting and rowing trips. 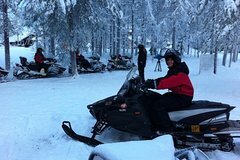 Snowmobiling is very popular in Kuusamo, and there are hundreds of kilometres snowmobiling routes. You may be lucky enough to witness the northern lights, or Aurora Borealis, if you visit between October and April. Bundle up and look up at night. If you plan your trip right, you may never see night. This is the land of the Midnight Sun. In Kuusamo, in the middle of summer, the golden sun hangs over the horizon and puts on a glorious show, turning the sky beautiful colours all night long. As always, make sure you leave plenty of time to get back to the Kuusamo Airport in time for your connection and enjoy your layover city rather than whiling away the time leaning up against your luggage in the departures lounge. 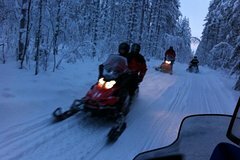 This easy 2-hour snowmobile safari will give you a chance to give your snowmobiling skills a try on your own snowmobile on the forest trails around the Ruka area. You will enjoy the beautiful wintry scenery and during the way you will make several stops to admire snowy nature. The pearl of Ruka nightlife: Explore the wilderness after dark on late night snowshoe adventure.<br>Have you ever experienced a night sky full of stars,arctic wintery silence around you, walking through the snow-covered, moonlit landscape, northern lights moving across the dark sky’ At the tarting point you'll shortly be introduced to snowshoeing. No previous experience needed. Proper winter clothing and an adventurous mind is all you need. After transfer we'll walk through forests and cross small frozen lakes, head in to the wilderness lit by our headlamps. While admiring the snowy landscape and winter night around us, we enjoy hot crowberry juice, hear stories about the nature around us and our cool arctic lifestyle. You also learn facts and fairytales about northern night sky and northern lights. If we make a campfire, we also plant a tree somewhere in the world. This adventure is provided by My Trail. We leave from Ruka Village at 8 or 9 pm depending on date. The itinerary is designed for those&nbsp;who wish not to only challenge their selves in the northern winter and experience&nbsp;all the must do -activities during their stay, but also learn about the way of life and connect with the local people along the way. 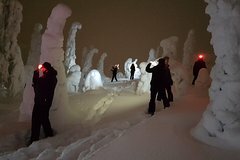 This 7-day all-inclusive (meals, transfers, equipment rentals, activities, accommodation) guided tour in remote Hossa national park area&nbsp;consists of; three separate 5-6 h snowshoe hiking days in different locations, doing a&nbsp;5h day trip with the huskies one day and visiting your guide´s&nbsp;family reindeer farm at&nbsp;the end. Building an igloo&nbsp;from snow, learning the tricks of&nbsp;ice-fishing and&nbsp;having a chance to see the northern lights are other highlights&nbsp;of the trip.